Experience SUP, Come Paddle with us! Come and experience a fun paddle at V&A Waterfront, Intaka Island Canals or One & Only private canals. All equipment is included and a short lesson is given, you paddle on your own or can pay for a guided tour. *INTAKA ISLAND EXPERIENCE CLOSED DUE - TO LOW WATER LEVELS. Please come join us at our CTICC Branch. I thought it was such an amazing experience, it was very relaxing SUPing through the canals and havi... - Kate Boyes. Book things to do at SUP Cape Town. 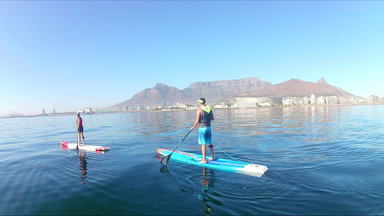 Find the best things to do at SUP Cape Town. What people say about SUP Cape Town. I thought it was such an amazing experience, it was very relaxing SUPing through the canals and having the beautiful senery and hotels around us. I enjoyed myself very much ! Fantastic. I will go back again anytime.